After checking out the Kite Fest yesterday the Mister and I found ourselves a bit peckish. To this end we headed over to San Loco to feast on cheap taco goodness. Follows is the sight that awaited us at the intersection of Driggs Avenue and North 4th Street. There are a number of things wrong with this picture. Can you find them? 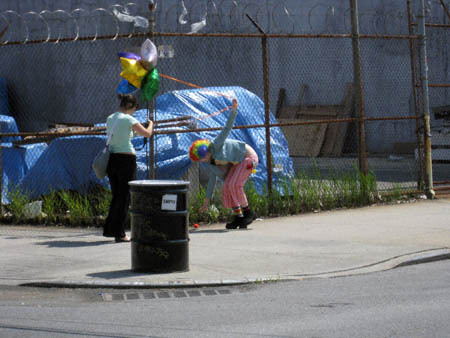 If you guessed “clown bouncing a rubber ball off the sidewalk” you are only half correct. Why the hell is this container sitting on the sidewalk at North 4th Street and Driggs Avenue? Is it waiting for a refill? 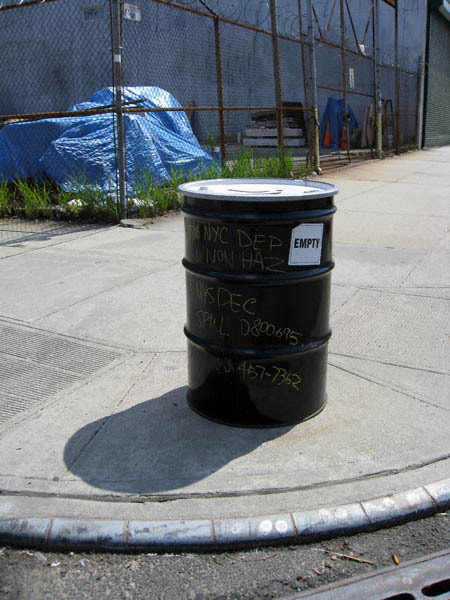 Has this container been placed here so people can drive up and dispose of their “non hazardous” spills quickly and conveniently? Inquiring minds want to know! Hell, it’s North Brooklyn (NoBro)–the whole area’s a toxic wasteland. 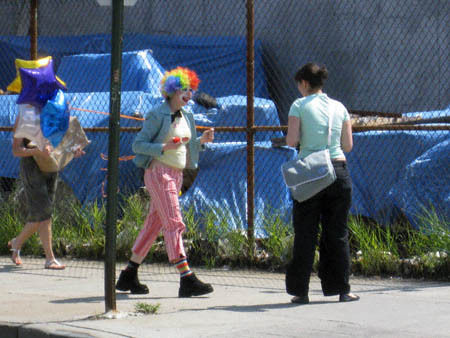 So the scary thing to me is the clown with the rainbow Afro, a wig used by a nutjob back in the ’70s who started the annoying trend of holding up “John 3:16” signs in the end zone stands of football games so’s to pass on the message (“For God so loved the world…”) to a captive TV audience after extra points. Now that is some scary stuff. Maybe it’s sort of like what clowns do at the circus but instead of a Volkswagen they try cram as many of themselves as possible into a drum containing toxic waste? If this has not happened yet, it should.